Recently retired BU head coach Jack Parker, always a candid commenter on the state of college hockey, sat down for a conversation with New England Hockey Journal’s Brion O’Connor about changes in the college game, competition for talent with Major Junior leagues, uneven rules enforcement and other topics. As usual, he pulls no punches. ►The Terriers continue their volunteer activities in support of Autism Speaks this past weekend, beginning their 10th season of involvement with the world's leading autism science and advocacy organization. The team provided support at a benefit marathon at Suffolk Downs (photo)and helped officiate and judge the Autism Speaks AMRAP (as many reps as possible) competition at CrossFit Homebase in Canton. ►Hockeysfuture.com has ranked former BU standout Matt Nieto as the #2 prospect in the San Jose organization. ►A pair of defensive mainstays on BU’s 2009 national championship team, Brian Strait and Kevin Shattenkirk talk about how their seasons with USA Hockey’s National Team Development Program advanced their development. Strait (video) is beginning his second season with the Islanders, while Shattenkirk (video), a candidate for the U.S. Olympic squad, will begin his fourth season with the Blues. Twenty-two former Terriers have participated in the NTDP program. Three future Terriers, 2014 recruits Jack Eichel and Johnathan MacLeod and 2015 recruit Charlie McAvoy, are currently in the program. ►McAvoy, playing for the U17s picked up his Team USA point with a power play assist in the team’s’ 4-3 OT win against Janesville. Defending champion (video) BU has been picked for second place in the Hockey East coaches preseason poll. The Terriers, who open regular season play on Oct. 11 against Rensselaer, received 48 points and 1 first-place vote in the poll. 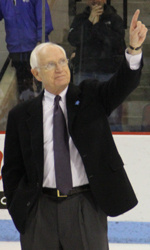 BC, picked for first place, received 56 points and seven first-place votes. Dan O'Regan was also #7 on that same Sharks prospects list. Denver Cutthroats play in the Central Hockey League not the ECHL.